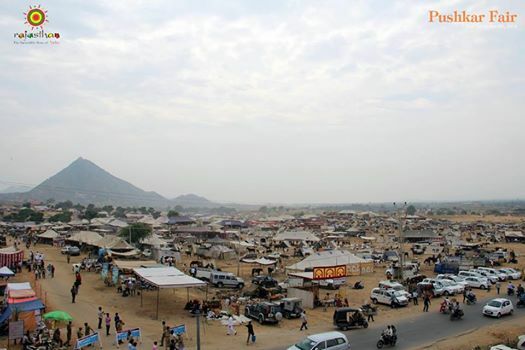 The day one of Pushkar fair- a feast for the eyes. Just when we step into the spiritual month of Kartik, The Theerth- Raj Pushkar witnesses a rare and phenomenal amalgamation of spiritual fervor, heritage and cultural effervescence at the world famous Pushkar fair. Each corner, street and ghat of the Pushkar along with mesmerizing sand dunes get drenched away in the vibrancy of colours with the men and women dressed in diaphanous traditional outfits, decorated cattle and excited and cheerful faces of the tourists. 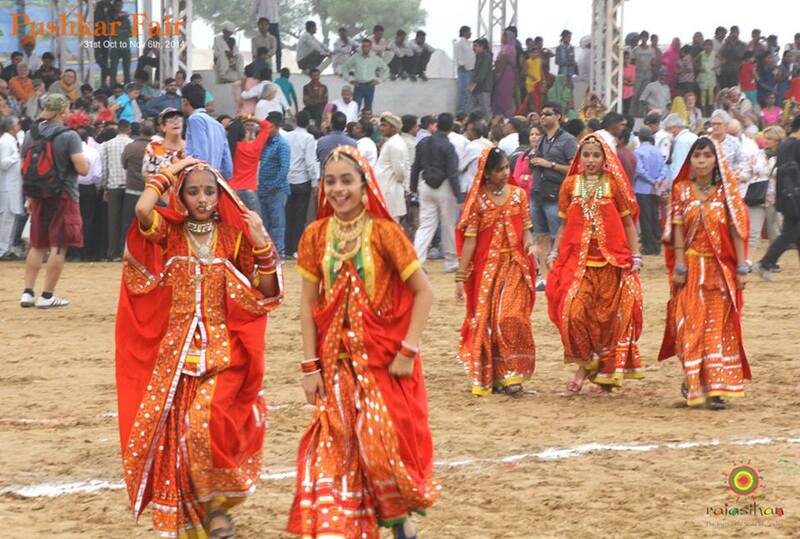 This year with overcast skies and pleasant weather due to the Nilofer effect, the Pushkar fair kicked off its 7 day extravagant celebration on 31st October with a flag hosting followed by Mandana competition embarking the beginning of festivity and celebrations. 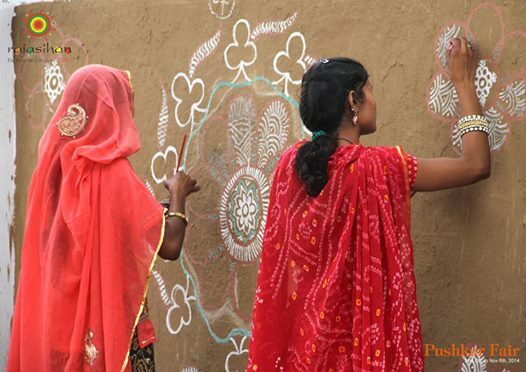 The beautiful patterns created with the use of fine lines in a perfect symmetry acquainted the visitors about the artistic skills and talent present in the hands of the rural women. Women participating in the Mandna competition. 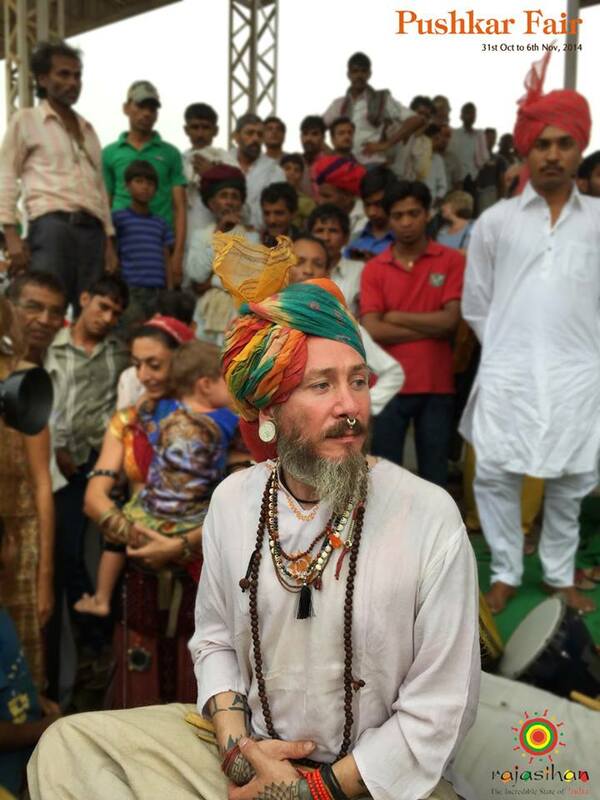 Many foreign tourists at the fair preferred adorning themselves in traditional attires like kurtas, safas and colourful ghagras which grasped the sight of many locals and as well as the fellow tourists. An energetic performance by the young school girls, beautifully dressed in traditional attires was applauded by all. Their innocent yet skillful moves left everyone spellbound. 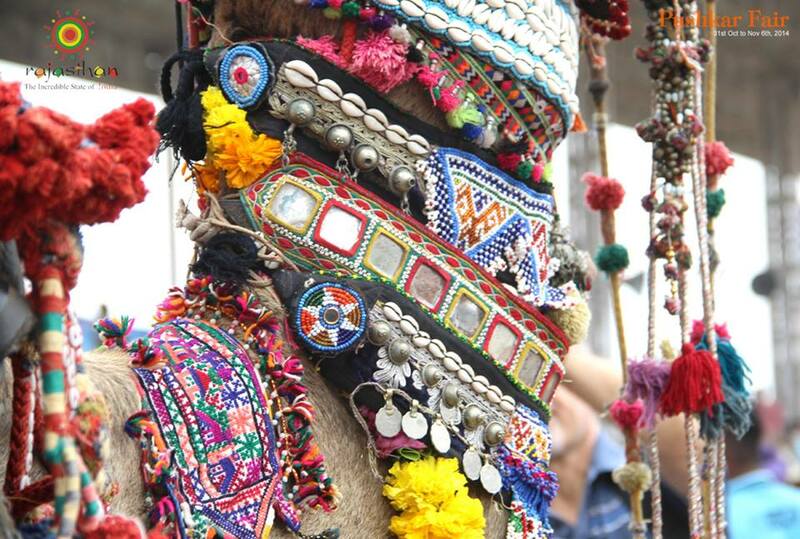 Camels elaborately decorated with the vibrant jewellery pieces attracted a lot of eyeballs and provided a peep into the colourful cultural and tradition of the state. The owners decorated the camels with vibrant accessories like mori, gorband, kantmal, loom, parchi, pilan, tang, mod, payal, ghooghra and poonch bandhani etc. 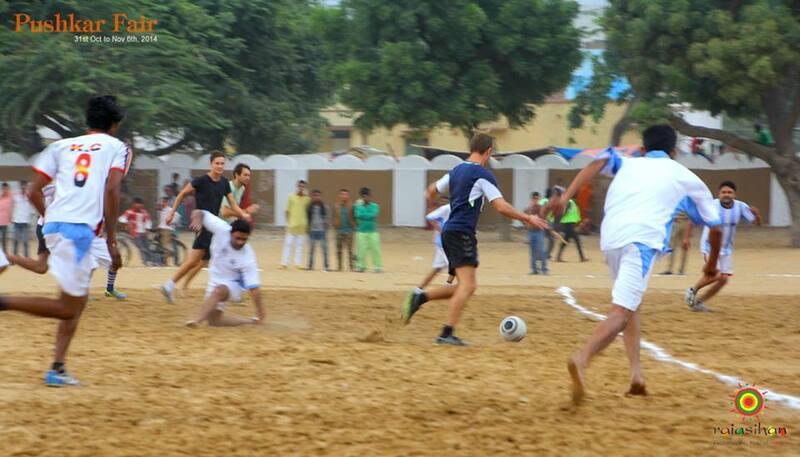 To get the real feel of the festival the tourists and locals participated in the football match with a great enthusiasm. The match was a very close one and both the teams showcased intense energy and a true sporting spirit but by the end the game went into the favour of the passionate team of tourists, who won the match. The bustling fair is also a shopaholic heaven. One can stack the bags with lovely beads, brass utensils, colorful bangles to leather goods, unique embroidery clothes and exclusive handicrafts, it offers everything that you have always wanted. 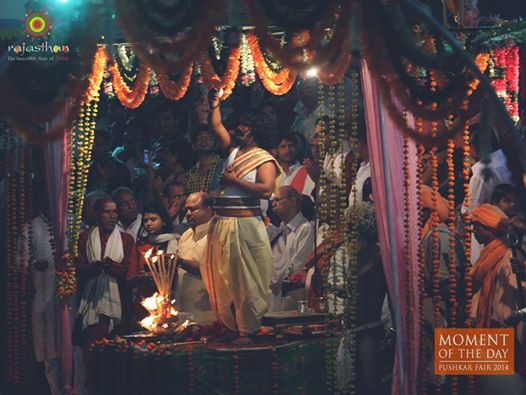 After a day filled with a plethora of energetic activities the day one of pushkar fair ended with the chanting of vedic mantras and prayers on the banks of Pushkar lake during the Maha Arati, which added a spiritual and mystical fervor to evening. The sight of the priest performing rituals and the illumination of lights gently drifting on the water surface made the evening more beautiful and alluring, looking forward to unfolding more days of fun and frolic. 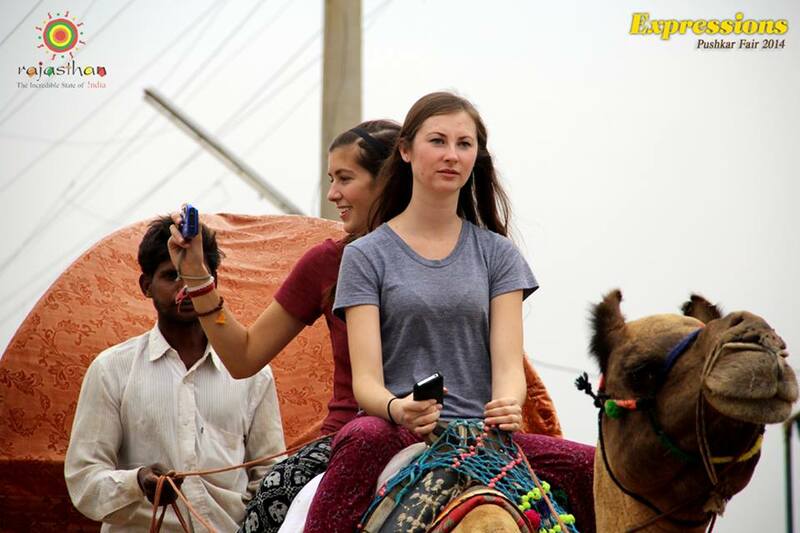 Photo Credits- Rajasthan fairs and festivals, Department of tourism Rajasthan.